Inland navigation is often the most cost-effective and least polluting means of transport and, with improved trade and exchange, has contributed to the development of the Nile Basin riparian states economies. Inland waterways can efficiently convey large volumes of bulk commodities over long distances. However, inland shipping remains an underdeveloped sector on most waterways. 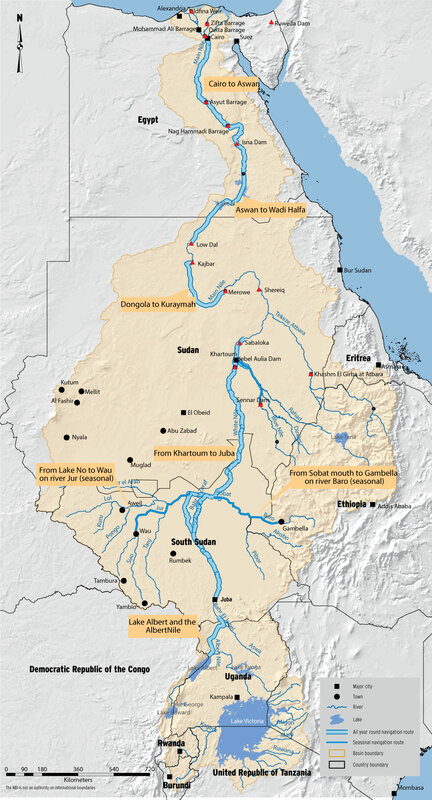 Nine of the 11 Nile riparian countries have navigable water bodies, and a total of 72 inland water ports between them, with Egypt and Uganda having the highest number. The main areas important for inland water transport are Lake Victoria which provides a vital transportation link for Kenya, Uganda and Tanzania with the main ports being Jinja and Port Bell in Uganda, Kisumu in Kenya, and Mwanza, Musoma and Bukoba in Tanzania; Sections of the White Nile in South Sudan, and the Main Nile in The Sudan and Egypt. In Egypt, the Nile is navigable by sailing vessels and shallow- draft river steamers as far south as Aswan. In South Sudan, steamers still provide the only means of transport facilities, especially where road transport is not usually possible from May to November, during the flood season. The Blue Nile has an 800 km stretch that is navigable during high water times. The main types of goods and services transported comprise agricultural produce, livestock, fish, general merchandise, and passengers. Inland ports, linked to other modes of transport connecting to international markets, also handle export/import traffic of agricultural products and manufactured goods. Navigation is a sector that does not consume water. It depends on the state of water resources in terms of quantity (a minimum depth is needed) and, quality (invasive aquatic plants or excessive solid waste in the water bodies would obstruct engines and waterways). It also brings the threat of potential hazards to water quality, such as oil spills from tankers operated on Lake Victoria, or ships degassing. Inland waterway transport on Lake Victoria Lake Victoria is the primary inland waterway servicing both the central and northern corridors. Lake Victoria acts as a principal waterway with commercial traffic. In conjunction with train services, Uganda and Tanzania operate train wagon ferries on the lake between railhead ports of the two countries and Kenya. Traffic across all public ports on Lake Victoria is estimated at 500,000 tons a year. However, it should be noted that local traffic has increased since 2005 while international transit traffic has been decreasing (imports to Uganda estimated at 3,000 tons in Port Bell over the last years). However, developing rivers for navigation often results in irreversible transformation of river courses, with negative impacts on vulnerable groups and ecosystems (such as fish mortality from propeller impact and larvae stranding due to drawdown). The hampering of port and navigation activities due to low water levels received much attention in the 2005/06 water level crisis on Lake Victoria. Lake Victoria transport system for passenger and goods suffered as well as its essential role for island connection. Declining water levels cause a decrease in draft and so ships cannot enter ports safely when the water depth is too shallow. During the water level crisis, various vessels had known difficulties to berth properly. Loading and offloading of passengers was severely affected in Tanzania. And several accidents involving their vessels found to be related to low lake levels. The minimum and maximum levels for days when accidents were reported are 10.76m and 11.05m (JJG) respectively. Generally it may be concluded that the safety of marine navigation in Lake Victoria cannot be guaranteed below an elevation of 11.33 m, which corresponds to the highest level in 1957 when the lake was surveyed. The operation of vessels below this level is risky and if it has to be done, reassessment of the routes to ensure safety would be required. Low lake levels would also compromise most of the maintenance structures functioning, leading to a high operational cost of navigation. In Kenya and Tanzania, maintaining the lake level between 11.5 and 12.5m (higher than the present 11m level) would rejuvenate navigational activities with positive effects to the livelihood and environmental sector. The opposite could be said of Uganda who heavily relies on power generation for livelihood at national scale. In general, it is envisaged that in all the five countries sharing Lake Victoria, the infrastructure, navigation risk and revenue will not be seriously affected while navigation and dredging cost may go up. These will in turn affect livelihoods and the environment.